On the 450th anniversary of the birth of William Shakespeare, the work of the great English playwright still has a powerful hand in literature, films and even television. Among the vast theatrical production of this genius, Macbeth is not just any historical drama. In this play, Shakespeare intended to convey the absurdity of existence, wrapping it in bloody shades. This is the story of the traitor king, victim of the fate of his own treachery. 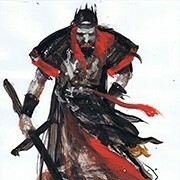 In vidasdepapel.com you can buy the original drawings made by Raúl Arias to illustrate Macbeth.